following the lives of two characters, Adam A and Adam B.
Adam B is homeless and Adam A is housed. A Tale of Two Adams was completed by Christine P'ng as a Master's Research Project submitted in conformity with the requirements for the degree of Master of Science in Biomedical Communications (MScBMC). Offered through the Institute of Medical Science, Faculty of Medicine, University of Toronto in collaboration with Biomedical Communications, Department of Biology, University of Toronto Mississauga. The goal of this project is to create a narrative data visualization of the relationship between homelessness and mortality that improves understanding of and encourages empathy towards Canadians who are experiencing homelessness. The data from the project comes from a research study on homelessness and mortality rates in Canada. It used census data from 1991-2001 to investigate mortality rates, remaining life expectancies at age 25, and probability of survival from age 25 to 75. It found that living in shelters, rooming houses and hotels is associated with much higher mortality than would be expected on the basis of low income alone. 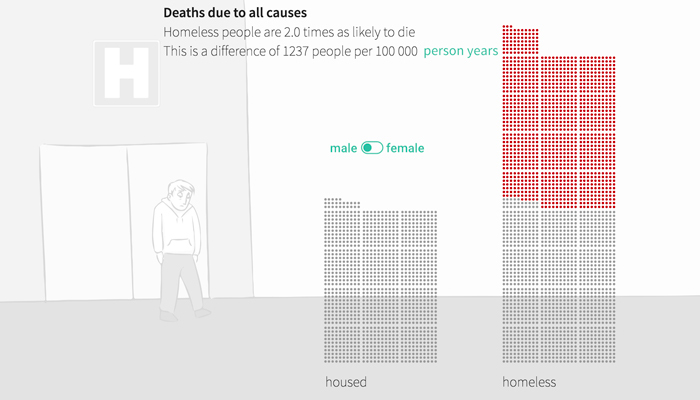 Most of the data visualizations found in A Tale of Two Adams investigate the differences in death rates between homeless and housed populations, by cause of death. 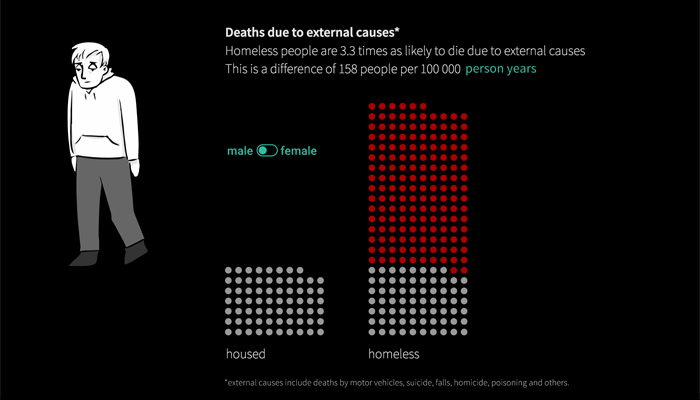 There are many more causes of death not shown in this project. To view the full dataset, please view the original study here. To view the data visualizations as stand-alone pages, visit the links below. 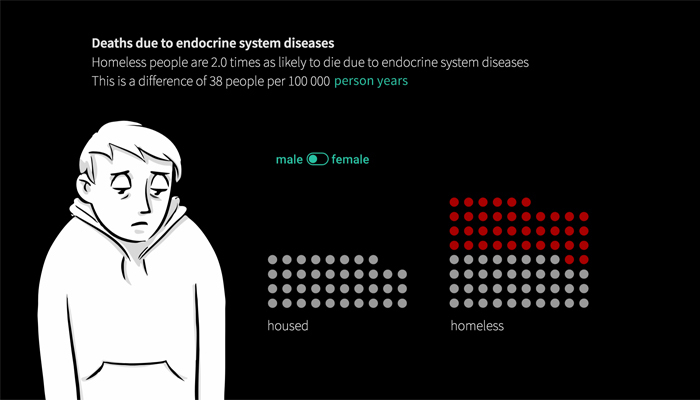 Endocrine system-related causes of death include diabetes mellitus and other diseases. 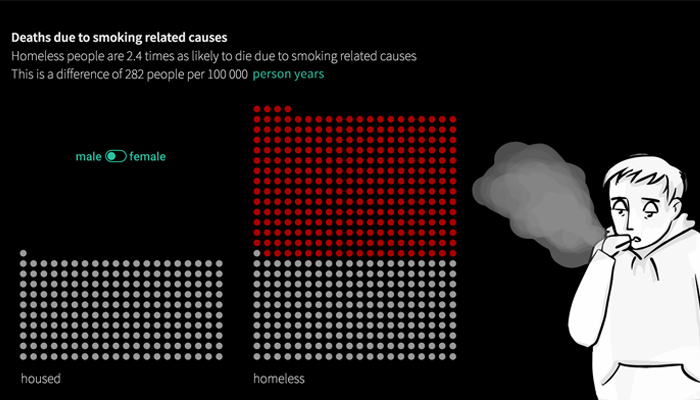 A visualization of deaths due to smoking-related causes. External causes of death include motor vehicle accidents, suicide, falls, homicide, poisoning and more. 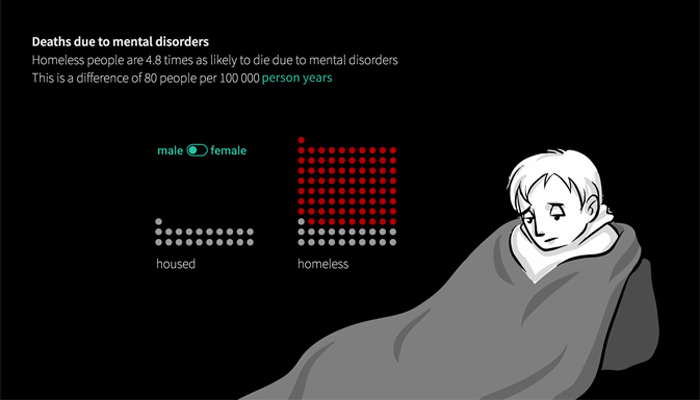 A visualization of deaths due to mental disorders. Circulatory system-related causes of death include ischaemic heart disease, heart failure, cerebrovascular diseases and more. 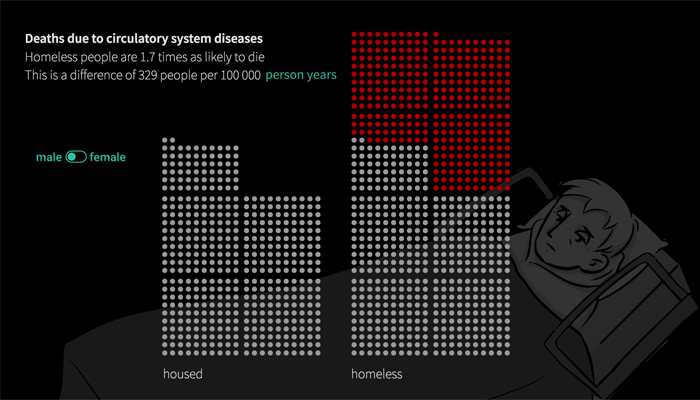 A visualization of total deaths due to all causes, including causes not discussed in this project.